South Korean tech giant Samsung Electronics has reported its first annual earnings decline in three years, in part due to a sharp drop in sales of mobile phones. Net profit fell to 23.4 trillion won ($21.3bn; £14bn) last year, a 27% fall from 30.5tn won in 2013. Mobile phone sales for the year fell 21% to 107.41tn won. Analysts said that competition in the Chinese market was eating into Samsung's profits. Samsung's mobile phone division saw profit in the final three months of 2014 fell to 1.96tn won compared with 5.47tn won a year earlier. The world's biggest mobile phone maker has been facing stiff competition from Apple and cheaper Chinese rivals. China is a key battleground for mobile firms. The country has the world's largest smartphone market, and Samsung's sales decline was evident there. Apple contributed to Samsung's latest reversal in fortune, launching iPhones with bigger screens that robbed Samsung's Galaxy phones of a key selling point. 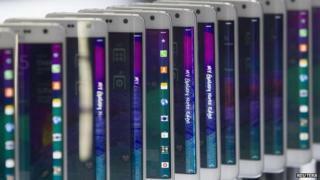 Samsung was already battling competition in low-end phones from upstart manufacturers such as China's Xiaomi. Samsung is struggling in countries such as China because "they're sort of being eaten from the bottom up by regional players" including Huawei and Xiaomi, said Ben Bajaran, an analyst at Silicon Valley research firm Creative Strategies. "And now with Apple being competitive in larger phones, you're seeing Samsung losing any edge they had at the high end," he said. Despite its earnings coming within market expectations, Samsung's shares closed down 1.3% in Seoul on Thursday. Demand for its smartphones and tablets will continue to fall in the first quarter of this year compared to the last because of seasonal factors, said Samsung in its results statement. "The mobile business will focus on increasing sales and improving business performance through new product line-ups, such as the Galaxy A series," it said. The company's lacklustre earnings come just a day after rival Apple reported the biggest quarterly profit ever made by a public company. On the positive end, a boom in Samsung's high-margin chip sales helped offset the downturn in its mobile business. Its semi-conductor division's operating profit jumped almost 36% in the final quarter of 2014.